Date: 19/07/10. First. Day. Of. School. Need I say more? It's really hard to believe, but in February, Valentine's Day was like my Inception. I admit, I didn't want to watch it as much as I want to watch Inception, but, you get the point, I was really excited about this one. Why? Because, you know, it has such a great cast. How is it possible that this movie could contain Jessica Alba, Kathy Bates, Jessica Biel, Bradley Cooper (*sighs*), Eric Dane, Patrick Dempsey, Hector Elizondo, Jamie Foxx, Jennifer Garner, Topher Grace, Anne Hathway, Ashton Kutcher, Queen Latifah, Taylor Lautner, George Lopez, Shirley MacLaine, Emma Robert, Julia Roberts and Taylor Swift?! Usually, a cast like this would be the recipe for success. It's a shame they didn't warn me that each cast member came with lots of sugar, therefore making this the recipe for candy that is waaaaaaaaaaaaaaay too sweet, it's sickening. 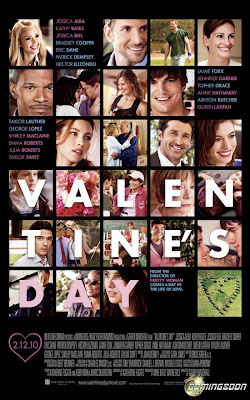 The title pretty much says it all: this movie is about intertwining couples and singles in Los Angeles and what they do on Valentine's Day. This movie is like every other romantic comedy. At this point in time, I think its almost impossible to even try and reinvent the genre because everything they do is so cliched. While watching this, I was thinking 'this has more twist and turns than a Christopher Nolan movie...shame I could see every twist coming.' Not that I would ever confuse this with a Christopher Nolan movie, that is a bit of an insult. There are so many stories, its hard to keep track of them all, and because of all the characters there is absolutely NO room for character development, which is one huge problem because every character is extremely stereotypical. The script is particularly unfunny, and you can tell this by the fact that the 'funny one-liners' which should be getting laughs actually come across as awkward silences. If anything, I still enjoyed parts of this movie to a certain point. I still love Anne Hathaway even though she was bad in Alice in Wonderland and this film doesn't exactly do wonders for her career. The other members of the cast were still okay, mainly because you could tell that they new what they were doing in this film: not a lot. And I've always had a weakness for chick flicks. Doesn't make Valentine's Day look like a fantastic day. I'm still recovering from the sugar overdose.